When a sports sedan makes almost as much power and torque as a supercar, you know it’s going to be as mad as a hatter. Yes, we’re talking about the Mercedes-AMG E 63 S. It pushes out an insane 612bhp and 850Nm. The Ferrari 488 GTB that we had for our ‘Best of 2018’ test develops 661bhp and 760Nm – both of which come much higher in the rev range. 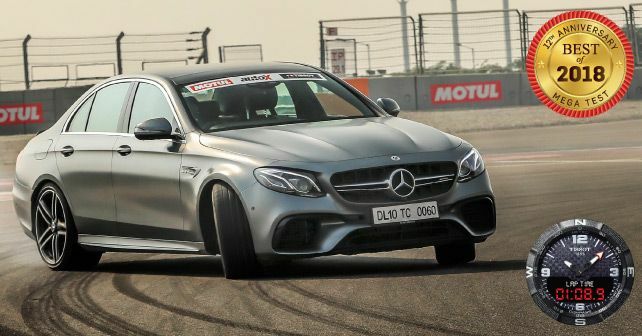 Consider this for a calculation, the E 63’s fastest lap around the circuit was 1.08:9 – just half a second slower than the Lamborghini Urus and less than a second slower than the 488. Sure, we weren’t pushing the Ferrari to the limit, but such incredible pace from this manic luxury sedan should be enough to give you some sense of just how insane the E 63 S really is. The E 63 S is fast, blistering fast! It does naught to 100km/h in just 3.4 seconds. Plant your right foot while at standstill, and you’ll will be shoved back into your seat. It’s almost like the car has had a few too many adrenaline shots. And while the tarmac rushes past at a terrifying pace, there’s an accompanying symphony of crackles and pops each time the car upshifts. The E 63 S thoroughly engages you, as you try your best to keep pace with the rising speeds. The nine-speed gearbox, meanwhile, is eager and quick – it doesn’t shy away from holding the redline while you’re mid-way into a corner. But, most of all, it’s the 4Matic all-wheel drive system that really saves you the embarrassment of soiling yourself. It’s the reassuring safety net that controls this mad machine. If it weren’t for this, you’d be making more stops for tyres than fuel. Of course, if that sounds like a good plan to you, you can always activate ‘Drift Mode’ and turn the tyres to smoke in no time. Yes, the engineers at Affalterbach have given this car ‘Drift Mode.’ And it works! Mercedes has been working wonders on the sketch board recently. And if you think that’s an exaggeration, simply look at any of their new-age products. The E 63 looks mean, especially in this shade of matte grey. Our test mule was fitted with an AMG performance pack that includes carbon ceramic brakes and carbon fibre bits all over the place. The greatest asset of the E 63 – other than the motor of course – is its usability. Being a four-door sedan, the AMG E 63 S is actually quite practical. Although based on the short wheelbase E-Class, there’s plenty of room at the back. Sadly, unlike the standard E, this one doesn’t get reclining seats at the back. The E 63 has been one of the most hallowed names amongst auto-buffs around the globe, and for good reason. This new-generation model pushes the envelope in almost every way. Along with a lot of electronic wizardry, it also packs more features and looks meaner than ever. But, most of all, it remains batshit crazy – and we simply love it!